Another day in Carpe Diem's haiku-paradise is knocking at evening's door. What a joy. Every day again I read lovely haiku, sometimes with humor, sometimes very sad, but it's always a joy to read all your submissions to our daily haiku meme. And today we are going further with all the wonderful prompts which I 'harvested' from the latest novel of Paulo Coelho. Today we share haiku on affection. And today I love to introduce this prompt with a short haibun. (PS. : I am a bit behind with commenting. I hope to catch up). She ... the moon ... always there, but not always in full clothing. Naked she stands at the dark sky when she is starting her new period with a New Moon. During 28 days she grows to her full sight ... than she shows us that she can be an even great light as her friend the sun. She ... the moon ... sometimes hidden behind a veil of clouds, sometimes brighter then her friend the sun. She ... as occurred last month ... she is closer to us then the sun will ever be. 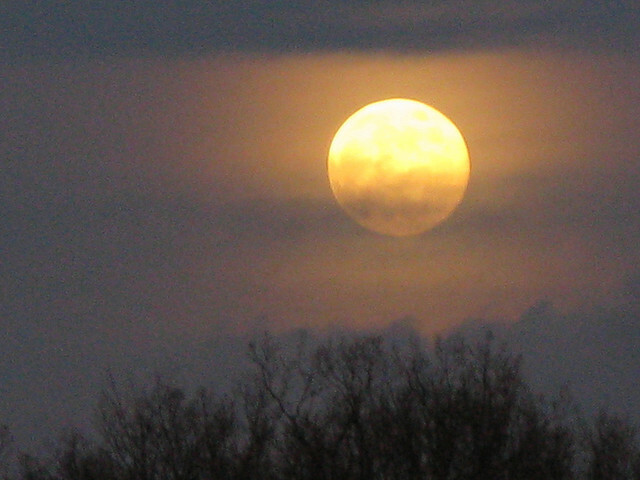 She ... in her full bright body ... stood 7 % closer to us with our last full moon ... she looked bigger then ever, but she ... at least here in The Netherlands ... was shy. She had never been so close to us ... it made her blush and her soft orange color enchanted me. I could feel her affectionate love for me, for us, for the whole world. She ... the moon ... our love ... always there, not always in sight, but we know she will be there for us always from now to eternity. I love her ... she the moon ... our bright, sunlight reflecting, moon ... our girl friend. She ... the moon ... once it was said that same gender love belonged to the night, they had to hide, so their love was only seen in the light of the full moon. She ... the moon ... their only friend. By the way: The Linking Widget for our Affection episode is open for submissions at 8.00 PM (CET). your haibun was beautiful...funny that the moon is a she, a girlfriend, but where did the 'man in the moon' go? The man in the moon still excist, but the moon "Luna" is a she, as the Sun "Ra" is male. Thank you Joanne for your kind comment. An absolutely fabulous, mysterious post Chevrefeuille. I thought you were quoting your writing. What you wrote...she - the moon...is so loving and beautiful even the un-haiku writing! I've been meaning to ask you for a clarification before but didn't. I've been writing haiku by maintaining only the 5-7-5 syllable count. To me that is haiku. There are no other considerations on kijo or any other things that I'm completely ignorant of. If you look at my posting here for prompt 'affection' it is really a prose but broken up just so the 5-7-5 is maintained in all the stanzas. Is this an acceptable haiku set? Thanks Kris! Even the old haiku masters (Basho, Buson, Issa, Shiki) didn't stick to a strict 5-7-5 layout. Free yourself of strict adherence to 5-7-5. My absolute favorite haiku book is "Writing and Enjoying Haiku: A Hands on Guide by Jane Reichhold. It's one of the less pretentious and the most accessible haiku books on the market and the 'ku is beautiful. It's packed full of writing tips beyond 5-7-5. I especially love her chapter on "Fragment and Phrase Theory." Now I feel reassured. I suppose there shouldn't be any restrictions when it comes to creative works. Your reassurance is most positive and most progressive. I appreciate it it very much. I'll look up the book. Good day Hank, As Lolly have said already the classical haiku poets didn't stick to the 5-7-5 count. Basho has written several years in the Kanshicho-style (my style of haiku writing) in which he didn't use the 5-7-5 count. Haiku which aren't written in 5-7-5 are also called 'in the way of the Chinese verse', so don't be that caught up with the 5-7-5 count Hank, write haiku from the heart and not with a count in it :-) The most western languages don't fit the 5-7-5 syllable count and there are a lot of wonderful Western haiku. Our featured haiku poetess jane Reichhold also doesn't always write her haiku with 5-7-5 and still they are haiku. Her website: www.ahapoetry.com is worth a visit. A lot of information about haiku (and other Japanese poetry). Basho once said: "learn the rules and forget them immediately. Write your haiku from the heart". I think that's art ... writing haiku right from the heart. Thank you for participating in Carpe Diem. And your comments. Lovely post today! I love the moon--I am a double Cancer, which is the moon's sign and a night person besides. This is a lovely lesson...thank you Kris.